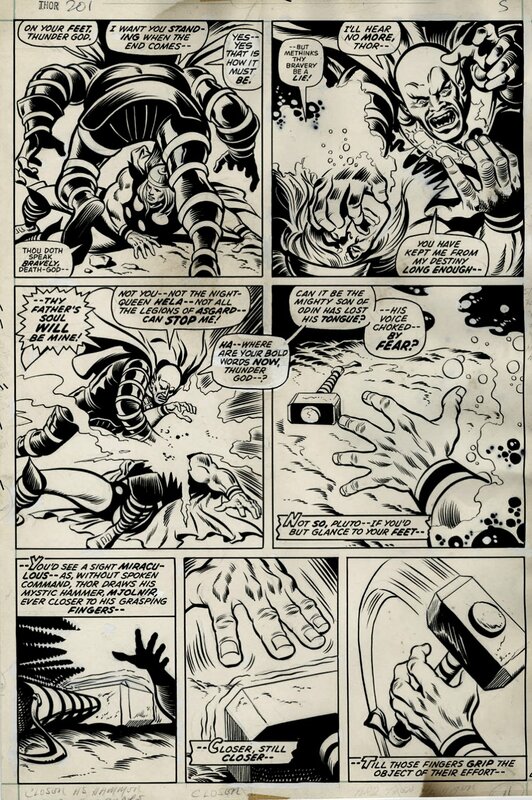 Thor takes on Pluto in EVERY PANEL in this intense Early Bronze Age 1972 battle page from Thor #201, with art by the respected team of John Buscema and Jim Mooney. John Buscema is one of the most important artists in Marvel history. He first worked with the company during the 1950s and then returned in the middle of the Silver Age, where he drew Avengers for several years and then made comic book history with his work on Silver Surfer and Conan the Barbarian. Buscema's work from this period was highly influential in establishing a new house style for Marvel that stayed in place for the following two decades. Jim Mooney had a long career extending from the Golden Age into the Bronze Age. He's best known for his work on the Silver Age Supergirl and for penciling and/or inking several issues of Amazing Spider-Man in the late Silver Age. In the 70s, he primarily worked as an inker for Marvel. Just a masterpiece by the handiwork of John Buscema and Jim Mooney. Some minor water damage at the top has a slight waviness to the board that does not affect the inks. ALL art on our website (including this one) are able to be purchased with VERY fair time payments, and trades are always considered towards "ANY" art on our website! Just send us an email to mikeburkey@aol.com and we can try to work something out.